It’s officially back-to-school season and although my husband and I have no kids of our own yet, we both work full-time and make a point to have home cooked dinners together whenever we can. Although I love cooking more than most other hobbies, it’s usually the last thing I want to do after a ten or eleven hour work day. And, since we have a rule in our house that whoever cooks doesn’t have to clean, that usually means Alex is left to do the dishes. Being the thoughtful 🙂 wife that I am, I wanted to come up with a meal that was equal parts tasty and mess-free. The thing I love about this recipe is it’s versatility. I’ve made this so many times with all different vegetables and seasonings (sweet potatoes + bbq sauce, green beans + broccoli + lemon juice/zest, peppers + tomatoes + taco seasoning) and it’s been such a time saver! What are your favorite time-saver meals? Season chicken with salt and pepper and marinade with half of the balsamic vinegar. Place chicken on the prepared sheet pan and bake in the oven. When the chicken is halfway cooked (about 10-12 minutes depending on the thickness), remove the pan from the oven and place the asparagus and cherry tomatoes next to it. Bake until the asparagus is tender and the chicken is cooked through. Remove from the oven and drizzle entire pan with the remaining balsamic vinegar. Top with fresh basil and freshly ground black pepper if desired. This recipe is a great balance of fat and carbohydrates. Add a small side of lean protein such as egg whites or turkey for a balanced meal. Dysphagia Level 2 – Ground/Mech Soft – serve as a soft taco either with a flour or corn tortilla or omit tortilla entirely and serve on a plate. Scramble egg instead of frying and omit salsa. Dysphagia Level 3 – Soft – serve as a soft taco either with a flour or corn tortilla or omit tortilla entirely and serve on a plate. Bake tortilla in oven for 5-8 minutes or until crispy. Mash black beans and avocado together in a small bowl and set aside. Coat a non-stick skillet with cooking spray and heat over med-high heat. Add egg and fry until yolk is set. Remove tortilla from oven. 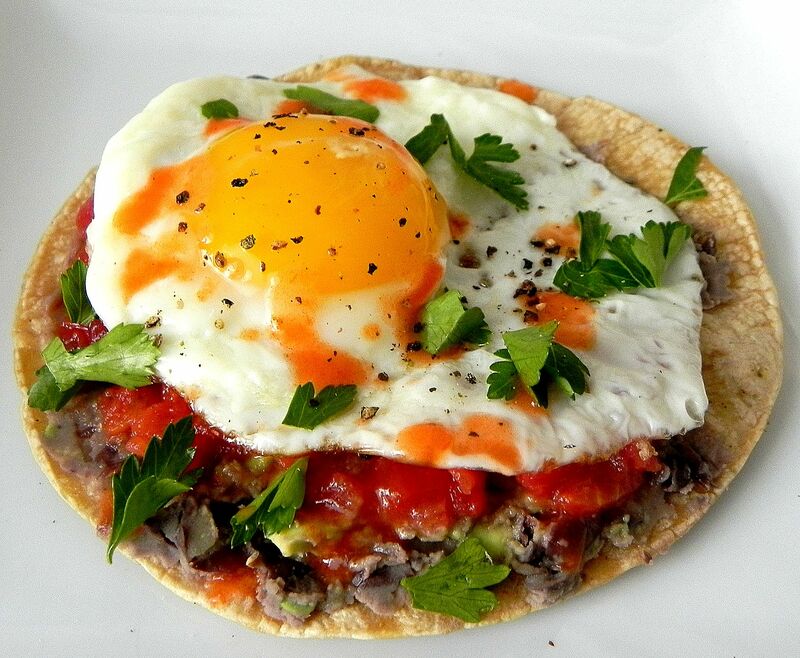 Top with black bean and avocado mash, then salsa, then fried egg. Garnish with black pepper, cilantro, and hot sauce, if desired.